remained relatively low at 600 to 800 meters. In the Northern Alps snow is present at valley level with 40 to 50cm at 1000m, 60 to 80cm at 1500m in the two Savoies and over a meter in the Isere. The risk of natural avalanches will be high (4/5) until midday Saturday and risk 5/5 in the Champsaur and Pelvoux. In the Hautes-Alpes the snow will intensify in the late afternoon and continue all night. The snowline will climb to 1800 meters in the Western mountain ranges ((Dévoluy and Champsaur) followed later in the east. There will be another 30 to 50cm of snow through to tomorrow morning, 50 to 70cm at 2000m altitude. There will be a lot of natural avalanche activity, especially when the rain starts. 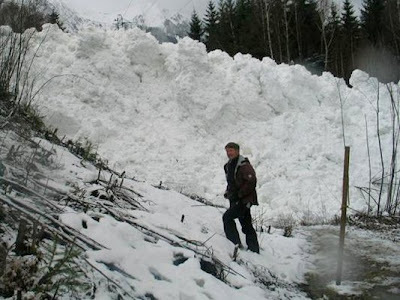 The main danger is at mid-altitudes where wet snow avalanches may cross roads. The Pelvoux and Chamsaur can expect some large avalanches at altitude. In the Northern Alps the rain/snowfall will progressively cross all ranges. There will be 30 to 50cm of very windblown new snow at 2000m by tomorrow morning. Rain will fall below that altitude from the early evening in the west of the Alps, later in the Savoie. The rain will provoke a number of natural wet snow slides in the deep snowpack which has not yet had time to stabilize. Roads may be blocked at mid altitudes. The risk of natural avalanches will drop from midday on Saturday with the arrival of cooler weather and the end of rainfall. However the risk for backcountry travellers will remain High (4/5) above 2000 meters. Meteo France advises that you check for road closures before travelling and follow any advice in ski resorts or given by other professionals. The col du Lauteret between Grenoble and Briancon is closed due to an avalanche (see forum). Movement is difficult in the Briancon region due to fresh snow and high winds. The main alpe d’Huez road is currently blocked at virage 7 by a mudslide. Traffic is chaotic. You can probably get to resort via Allemond and Villard reculas but the road is difficult. The Col de Montets road to Vallorcine is closed due to avalanche risk. There are road closures in the Hautes-Alpes. The avalanche protection had only just been completed despite complaints from locals that it was ugly.